(China Press USA) May 19, 2010. Zhai Tiantian is a Chinese graduate student at the Stevens Institute of Technology in New Jersey, USA. According to his lawyer Mr. Hai Ming, Zhai was arrested by New Jersey police on May 16. On that day, Zhai had a verbal dispute with this professor over his work. No physical altercation took place. But Zhai Tiantian said something along the lines of "at worst, I will risk anything on the line" and the professor called the campus police. The campus police arrested Zhai and turned over to the New Jersey police. Zhai is presently held in Hudson County jail. He is unable to raise the USD 20,000 bond. According to the indictment sheet, Zhai Tiantian is facing the serious charge of "terrorism." Specifically, he attempted to set fire to the campus. Zhai Tiantian deny ever committing arson, not even making any verbal mention of such act. On the day of the incident, Stevens Institute of Technology immediately canceled Zhai's student visa. On the next day, the Immigration and Naturalization Services ordered his arrest. On the third day, INS issued a deportation order. Mr. Hai Ming said that America is a nation with freedom of speech. As such, people cannot be convicted on the basis of what they think or say. Therefore Zhai's case is wrongly handled. Zhai has a government-appointed lawyer on the criminal charge and Mr. Henning is handling the immigration part. The outcome of the criminal case will ultimately determine whether Zhai will be sent back to China. If convicted, Zhai cannot possibly be allowed to stay in the USA because he is a convicted terrorist. According to the Chinese Consulate's Overseas Chinese Affairs consul Luo Gang, he has previously handled similar cases in which Chinese students ended up in clashes over verbal expressions or actions. "Chinese and American cultures are different, so that what the Chinese regard as acceptable speech may be regarded by Americans as threats. This is an unfortunate incident. Even though the principal intended no harm, he has done himself a great deal of harm. We don't want to see that. The case is in the judicial phase, and we must depend on the lawyers to provide aid to him." Ms. Wang of Xi'an could never imagine that her son Zhai Tiantian who is studying in the USA could be charged with being a "terrorist" and faced with deportation. Yesterday our reporter met with the haggard-looking Ms. Wang in Xi'an city. She said that ever since learning about her son's case, she has been sleepless several nights in a row because she was washing her face with tears. In mid-May, Ms. Wang received a surprise call from a fellow student of her son. This female student told her that Zhai Tiantian has been arrested by American police and currently incarcerated in a New Jersey prison. "It was like a thunderbolt out of a clear sky. He was studying in the USA, so how can he be arrested?" Ms. Wang said. "I don't understand. My son got into trouble last month. So far, no organization has informed us about anything. If not for that fellow female student, we wouldn't even know by now." Zhai Tiantian's father Zhai Taishan said that the family has not been able to contact his son since the middle of April. It was as if his son had evaporated into thin air. According to DWnews, Zhai Tiantian had no relatives in the USA and therefore nobody knew that he was in prison. In mid-May, he made a collect call to the Chinese Consulate for help, and that was how his case became known. Our reporter contacted the female student who called Ms. Wang. According to this student from Taiwan, Zhai Tiantian was arrested after a verbal quarrel with a professor, who thought that Zhai said some threatening things. In the complaint filed by the Stevens Institute of Technology, Zhai Tiantian was characterized as a "terrorist" because he attempted to set fire to the campus. The school expelled Zhai, the Immigration and Naturalization Services issued a deportation order and the police arrested him. Overnight, Zhai Tiantian went from an ordinary overseas Chinese student to a suspected "terrorist" who is endangering homeland security in the USA. The female student said that "Zhai Tiantian was a bit brash in his quarrel with the professor. But according to Zhai, he absolutely did not say anything like setting fire to the school." She said that Zhai Tiantian was a good student who got along with his fellow students. They like this young and smart Chinese student. She does not understand how he could be a "terrorist." ... The American government and people have always regarded themselves as the standard bearers for the freedoms of expression and religious belief. Undeniably, America is better here than many other nations. But this does not mean that America is above and beyond reproach, nor does it mean that America is actually able to realize the freedoms that they talk about. For example, the American government and people say that freedoms of expression and religious belief are universal values. Yet, the US Immigration and Naturalization Services' regulations excluded entry by persons who have advocated Communism. (Reportedly, the regulations no longer say so even though the principle continues to be operational.) American citizens have the right to advocate and believe in Communism and the Communist Party is a legal political party in the USA. Americans can do it but others cannot. What does this say? This means that the American government does not think that the freedoms of expression and religious belief are universal values. Alternately, the American government thinks outsiders should not enjoy the freedoms that American citizens have. After the 911 incident, American society has clearly rolled back on the freedoms of expression and religious belief. On October 26, 2001, President George W. Bush signed the USA Patriot Act which was passed by a bipartisan majority in Congress. Thereafter, speech can be labeled "terrorism." The case of Zhai Tiantian is not the first and it won't be the last. Terrorism is, in the most general sense, the systematic use of terror especially as a means of coercion. At present, the International community has been unable to formulate a universally agreed, legally binding, criminal law definition of terrorism. Common definitions of terrorism refer only to those violent acts which are intended to create fear (terror), are perpetrated for an ideological goal, and deliberately target or disregard the safety of non-combatants (civilians). Some definitions also include acts of unlawful violence and war. The history of terrorist organizations suggests that they do not select terrorism for its political effectiveness.Individual terrorists tend to be motivated more by a desire for social solidarity with other members of their organization than by political platforms or strategic objectives, which are often murky and undefined. The word "terrorism" is politically and emotionally charged, and this greatly compounds the difficulty of providing a precise definition. Studies have found over 100 definitions of “terrorism”. The concept of terrorism may itself be controversial as it is often used by state authorities to delegitimize political or other opponents, and potentially legitimize the state's own use of armed force against opponents (such use of force may itself be described as "terror" by opponents of the state.). A less politically and emotionally charged, and more easily definable, term is violent non-state actor (though the semantic scope of this term includes not only "terrorists," while excluding some individuals or groups who have previously been described as "terrorists"). Terrorism has been practiced by a broad array of political organizations for furthering their objectives. It has been practiced by both right-wing and left-wing political parties, nationalistic groups, religious groups, revolutionaries, and ruling governments. One form is the use of violence against noncombatants for the purpose of gaining publicity for a group, cause, or individual. My reaction after reading the above: slippery as an eel and impossible to nail down. Anyone who says the wrong thing in haste, especially foreigners, may be framed up as "a terrorist" by patriots or villains. Chinese people are familiar with this sort of thing through the term "counter-revolutionary." How will the Zhai Tiantian case end? Hard to predict. But no matter what the outcome is, it is a cautionary tale. For whom? Everybody. But especially for those America worshippers who naively, honestly, stubbornly and foolishly think that America's freedoms of speech and religious belief have no national borders, no restrictions, no intolerance and no limits. 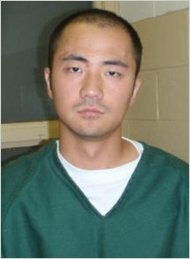 (Global Times) Chinese PhD student charged with 'terrorist threat' in US over dispute By Huang Jingjing. May 24, 2010. Zhai Tiantian, 27, a Chinese student who was pursuing a doctorate in the US, has been accused of trying to set fire to a campus building in April after an ugly dispute with a professor. His parents in Xi'an, Shaanxi Province were reportedly in the dark about their son's troubles until a classmate called them this month. "It hit us like a bolt out of the blue. My son has been doing well there, how could he be arrested?" Zhai's mother surnamed Wang told the local Chinese Business View in Sunday's edition. Zhai went to the US in 2003 and was pursing a PhD at the School of Systems and Enterprises at Stevens Institute of Technology in New Jersey, the Shaanxi-based newspaper reported Sunday. The parents learned their son was arrested and jailed for a month. On April 15, Zhai had an argument with his professor over his academic scores. Zhai allegedly said he would do whatever he could to get revenge. The professor called local police and the next day, Zhai was arrested, US-based China Press reported on May 20 without elaborating. The university canceled his student visa and the immigration office issued an arrest warrant the next day and a deportation order the following day, according to the newspaper. An indictment said Zhai tried to set fire on the campus and it was considered a "terrorist threat." Zhai denied he tried to start a fire. Zhai's lawyer, Haiming, an American Chinese, said the university may be attempting to extract revenge on his client for his earlier comments, the report said. Zhai complained about racial discrimination at the university during a television interview and claimed that he would file a lawsuit against them, prior to the argument with the professor. "This is possibly the reason the university started trouble against him," said the lawyer, adding that his client did not deserve a criminal charge for his emotional comment during the dispute with his professor. "The US should not be a nation to convict people on words. Even if Zhai made some improper statements, he doesn't deserve such a charge," the lawyer said. However, the situation is not in Zhai's favor, the lawyer told chinesenewsnet.com because the case is complicated and involves not only the university, but also the police and the immigration department. Zhai is being held at the Hudson County Correctional Center, which is across the river from New York City, the report said. Zhai's father called the university but the university said Zhai no longer has any ties to the university, the China Business View reported. Luo Gang, the Chinese Consul General in New York, said such cases originate usually out of cultural differences, according to the China Press. (China Daily) US College Confirms Threat from Chinese Student May 26, 2010. A Chinese graduate student, Zhai Tiantian, who has been arrested and jailed for more than one month in the United States, threatened to "burn to the ground" a campus building, according to officials from the Stevens Institute of Technology, where Zhai was enrolled. Institute officials, who spoke to China Daily on Monday local time, confirmed Zhai is facing the charge of "terrorism". Zhai, 27, from Xi'an of Northwest China's Shaanxi province, has become the first Chinese student to face such a charge in the US, his New York City lawyer, Hai Ming, told China Daily. Zhai's family on Tuesday turned to China's Foreign Ministry for help and are awaiting a response. The university said doctoral student Zhai, who went to study there in 2003, was first suspended from the school for "disciplinary reasons" in March. "And on April 15, Zhai was arrested after threatening to burn to the ground a university building. Police determined that the threat was credible and took appropriate action," the university said in a statement to China Daily on Monday. Zhai, who is currently in the Hudson County Jail in New York state, also allegedly posed threats to one of his professors with whom he had a disagreement. The statement said Zhai's behavior, over a period of months, was deemed to represent a threat to the well-being of others. The suspension has nothing to do with conflict or difference of opinion with academic faculty, as some reports have stated erroneously. According to the statement, on the day of the incident, Stevens Institute of Technology immediately canceled Zhai's student visa. On the next day, the Immigration and Naturalization Services (INS) ordered his arrest. On the third day, INS issued a deportation order. The university said that in March, they suspended Zhai after a thorough investigation but would not reveal details as "disciplinary actions are confidential". Zhai's lawyer Hai said on Monday that he is collecting evidence and will meet Zhai in jail this week. "So far there is little evidence that can prove Zhai was about to commit arson," he said. "Only one professor said he heard Zhai claiming to burn the school building." According to US laws, people cannot be convicted on the basis of what they think or say, Hai said. In the past, Hai has dealt with many similar cases involving conflicts between Chinese students and their professors in US universities. "But this is the first time that a Chinese student has been charged with 'terrorism'," he said. The lawyer said he has sought help from some congressmen from New York state who have agreed to write to relevant departments. "Those congressmen agree that we should avoid overusing claims of terrorism," he said. A US-based Chinese newspaper reported that on April 15, Zhai had a verbal dispute with his professor, Rafael Collazo, over his academic work, but no physical altercation took place. The professor has claimed that Zhai said some threatening things to him so he reported Zhai to the school's authorities, saying that Zhai posed a potential threat to the school. The outcome of the criminal case will ultimately determine whether Zhai will be sent back to China. If convicted, Zhai might not be allowed to stay in the US. "His mother and I would be happy if our son comes back to China," said Zhai Taishan, who has not seen his son for eight years. 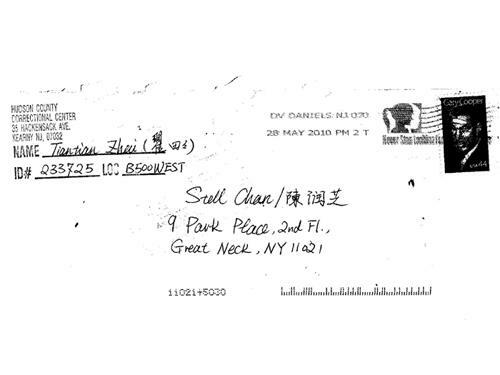 (Global Times) US clarification needed on Zhai Tiantian case May 27, 2010. A promising Chinese student is in a sticky situation with the US government. Zhai Tiantian finds himself charged with terrorism following a verbal spat with a professor. Details remain unclear one month after he was arrested, except that he allegedly used some strong words during the spat. Not a single US government agency has come forward and given any explanation for the abrupt arrest and the ludicrous charge. The story seems hard to believe, but it is all too real for Zhai, a 27-year-old Chinese citizen pursuing a PhD in New Jersey. He was jailed in April, but the Chinese embassy has not yet been notified by the US government of his arrest. It was through the help of a person just released from jail that a message was sent to Zhai's father in western China. At first glance, cultural differences seem an easy target for blame in this case. As some Americans may argue, in a society ruled by law, it is not uncommon for anyone who verbally threatens to "burn to the ground" a campus building, as Zhai is alleged to have said, to be a suspected terrorist and treated as such. But in essence, the incident lays bare the deep-seated disrespect for Chinese people by the US government, which has long boasted its respect for freedom and human rights. A few days ago when some Chinese media inquired into the case over the phone, some officials from the Stevens Institute of Technology, where Zhai is a student, excused themselves, saying they knew nothing about it, and bluntly hung up the phone. Had the incident taken place in China, some US media outlets would have used it to cast blame on China's human rights record. No less evident in the case is the pressing need for China and the US to make concerted efforts in further protecting the interests of overseas Chinese. As shown in statistics released Wednesday by China's Ministry of Education, the number of Chinese students studying in the US has steadily increasing in the past few years, totaling about 100,000. That surge in students makes up a small section of the roughly 35 million overseas Chinese across nearly 150 countries and regions in the world. Though riding the waves of opportunities abroad, they often find themselves confronted by rivalries, prejudices, and unfair treatment in various forms. While a more united front can be built among overseas Chinese to protect themselves, diplomatic missions have a crucial role to play in implementing mechanisms, such as consular protection and coordination with the US government, to safeguard the interests of Chinese citizens abroad. When it comes to Zhai's case, more information is needed. Chinese people have the right, on both a legal and a diplomatic basis, to know what has happened to their compatriot and to be kept posted on details of the case. A reasonable clarification regarding this case should be given to the Chinese embassy and Zhai's family by the US government, and the school, as soon as possible. Does the US respect freedom and human rights as much as it claims to? Zhai Tiantian's case could serve as an eye opener. (Steven Institute of Technology) May 28, 2010. 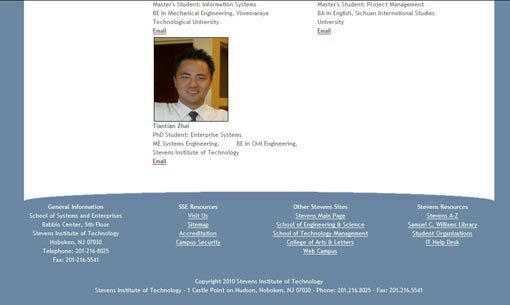 Zhai Tiantian, or TJ as he was called by his friends, was a regular graduate student here at Stevens Institute of Technology before he was arrested on charges of making terroristic threats to the school. Now he sits in the Hudson County Correctional Facility, awaiting his trial and possible deportation, and his case has unexpectedly caught the eye of international press outlets, whose coverage, according to Institute officials, has blown the case out of proportion. On April 15, Zhai called into the Howe Center Desk and made a verbal threat to burn down one of the campus buildings. The dispatcher reported this threat to the police, who found the threat to be credible and arrested Zhai later that day said Michael Schinelli, Assistant Vice President of Graduate Marketing and Communications. Since Zhai is a foreign national, a Chinese citizen, the police also informed the Department of Homeland Security (DHS) that they would be making an arrest. The DHS then independently made a decision as to their involvement, and aided campus police with the arrest. There will be a grand jury hearing for Zhai on June 1, when some members of the administration will be testifying. Campus police would not confirm which campus building was threatened in Zhai's call. Zhai matriculated at Stevens in 2003 and received his Bachelor of Engineering in Civil Engineering and his Master of Engineering in Systems. He was pursuing a Ph.D. in Enterprise Systems at the time of his suspension. Schinelli described Zhai as "well-Americanized and integrated into the Stevens community." The first complaints about Zhai began in February of this year, when members of the Stevens community raised concerns about Zhai's behavior in academics and the workplace. Around early March, Zhai began showing alarming behavior. Stevens officials had an official meeting with Zhai on March 9 to discuss his behavior. An investigation concluded that Zhai's behavior violated the Stevens student code of conduct, though Schinelli could not comment upon the specific infractions because of student privacy laws. Stevens determined that Zhai's behavior was putting other students in jeopardy, and on March 11 he was indefinitely suspended from the school. Zhai appealed the suspension, but the appeal was turned down. Days earlier on March 5, Zhai was visiting Manhattan to see someone affiliated with NYU. On March 10, he was arrested by the NYPD for aggravated harassment in the second degree connected to events that transpired on March 5. Joseph Stahley, Assistant Vice President of Student Life, clarified that Zhai's suspension was unrelated to this arrest by the NYPD and was a result of a series of events that transpired here on campus alone. According to media outlets, Zhai denies the charges against him and says he never mentioned destroying campus buildings to anyone. He sees the arrest as an attempt by the Institute to deal with his questioning of the school's authority. Before his suspension, Zhai claims that he had argued with a professor over his academics. In addition, he also previously spoke out against the Institute in a TV interview, threatening to sue the school for discrimination. Hai Ming, Zhai's government-appointed lawyer, said "[t]his is probably the real reason why the school is dealing with him this way." Zhai's story is notable because it has been taken up by international media who, according to Schinelli, are misreporting the details. China Daily, for example, has reported that Zhai was arrested for charges of terrorism. According to their website, "Zhai has been accused of trying to set fire to a campus building and of making threats to one of his professors with whom he had a disagreement." However, Schinelli says that these are not the facts of the case. Schinelli said Zhai is charged with making terroristic threats, not with being a terrorist. "Making a terroristic threat is not the same as being accused of being a terrorist. It covers a broad range of offenses and threats…We're not sure what was pushed out there that generated what's probably a hard to believe story in this country. Over [in China], it certainly seems plausible that someone might be thrown in jail because they disagreed with a professor. [It's]...not anything that would happen over here in real life. That's obviously not how things work in an American university." Schinelli does not know where the source of this misinformation came from but noted that it could either be coming from Zhai himself or China's government-controlled media. Schinelli says it's hard to tell whether the false story was purposefully orchestrated or if the new sources were simply misinformed. Since the story broke, several Chinese press outlets have contacted Schinelli for Stevens' side of the story, and Schinelli has corrected several of their reports. One press outlet thanked him for the corrections and reprinted their story. They even stated that Chinese readers were interested in Stevens side of the story. Other sources such as NJ.com and the Associated Press have contacted Schinelli as well. Schinelli said that they chose not to publicize the arrest in order to avoid embarrassment for both Zhai and the school. It was not until foreign press became recently involved that the school began receiving phone calls and emails on the matter. Schinelli said, "We do not want have Mr. Zhai vilified by the media nor do we want [Stevens'] reputation to be affected." Schinelli said, "We have an incredible international student community here that we value tremendously." He added, "Were hoping that Mr. Zhai can obviously be returned to his family, that he can receive any help that he needs, and we wish him well. But we certainly want to dispel the stories that we've seen in the foreign press." …Even the campus police who arrested me, who I have known for years, privately admitted to me that, if he tells me the truth behind my arrest, he would lost his job, to which I replied: “That’s okay, I won’t blame you and I forgive you. While we seek justice, I would like to keep the collateral damage to a minimum. Knowing the person who I believe to be responsible, I wouldn’t be surprised if he fires a lot of innocent people just to shut their mouths which he already have, from what I was told by friends from the outside. While 中國領事館 (translation: the Chinese Consulate) further investigate my case, I would suggest the media and caring reporters, such as yourself, to call Stevens institute for an explaination of my arrest, and the reason for denial of my appeal. Ms. Weatherall --- Vice president, who denied my appeal without explaination, ignored my tution referral request. On May 28, the Stevens Institute of Technology published a report on the Zhai Tiantian in the campus newspaper. The report said that on April 15, Zhai Tiantian went to the students affairs office at the Howe Center Desk and said that he wanted to set fire to a campus building. The school informed the police about this "verbal threat." According to the newspaper, the police thought that this was a credible threat and therefore arrested Zhai Tiantian. The assistance vice-president of graduate studies Michael Schinelli said: "We are not sure what took place that caused led to this unbelievable story. In China, it may be possible for someone to be sent to prison for having an argument with a professor. But this could not possibly happen in American reality." But on April 15, Zhai Tiantian was arrested by the local police deputy chief, the US Immigration and Customs Enforcement and the Stevens Tech campus police. (New York Times) After Call, Student Faces Deportation to China By Kirk Semple. July 2, 2010. School officials contend that Mr. Zhai, 26, angered over his suspension from the university for disciplinary reasons, called the switchboard at the campus’s main offices and said, “I’m going to burn that building down.” Mr. Zhai’s advocates say that while he used inflammatory language, he was speaking metaphorically, to describe the effect of a lawsuit he planned to file against the university challenging his suspension. “He told me that he said, ‘I’m going to burn down Stevens by suing them and going to ABC and CBS,’ ” Mr. Sova said. “He is somewhat impulsive.” Mr. Sova added, “I think that was a horrible use of language.” To make matters worse for everyone involved in the case, Stevens officials say, the charge against Mr. Zhai has been misinterpreted, particularly in the Chinese news media, as accusing him of acts of terrorism. The university’s special counsel, Chris Adams, explained that New Jersey law uses the term “terroristic threats” to describe “statements made with the purpose to cause serious public inconvenience.” “Unfortunately, it shares the same word as ‘acts of terrorism,’ ” Mr. Adams said “No one is suggesting that this is terrorism.” If convicted, Mr. Zhai faces a penalty of as much as three to five years in prison, Mr. Adams said. In early March, the woman, a graduate school instructor at a university in New York City, filed a harassment complaint with the police, Mr. Hai said. A friend of the woman, a professor at Stevens, also became involved in the romantic dispute, complicating Mr. Zhai’s life at the school and perhaps leading to the university’s action against him, Mr. Hai said. On March 11, Mr. Zhai received a letter from an assistant vice president at Stevens saying he had been suspended indefinitely. The letter, while offering no details, stated that Mr. Zhai had violated several provisions in the Stevens Student Code of Conduct involving harassment, intimidation and “conduct that threatens or endangers the physical or mental health or safety of any person.” “The overall conclusion is that your presence on campus is a health and safety risk to members of the Stevens community,” the letter said. On April 15, Mr. Zhai called the main administration building at Stevens, officials said. A campus police officer answered, and Mr. Zhai told the officer what was on his mind. That evening, the campus police, accompanied by federal immigration agents, appeared at Mr. Zhai’s door and took him into custody. News of the case has been reported across China, and at least one newspaper, the English-language edition of The Global Times, which is backed by the Communist Party, has found geopolitical resonance in the matter. “The incident lays bare the deep-seated disrespect for Chinese people by the U.S. government, which has long boasted its respect for freedom and human rights,” a May 27 editorial said. (Hudson Reporter) Stevens Institute student enters 12th week in Hudson County jail July 6, 2010. A 26-year-old student at the Stevens Institute of Technology in Hoboken, who allegedly was angry after being suspended, has now spent nearly 12 weeks in the county jail in Kearny. He is facing deportation to China. School officials allege that the doctoral student, Zhai Tiantian, called the school switchboard several months ago and said, "I'm going to burn that building down." The case has received more attention in China, and according to the New York Times, it "has bloomed into a minor international incident ... Chinese diplomats in New York have appealed to the university to help Mr. Zhai." A friend of Zhai told the Times that the student had used provocative language and threatened to sue and go to the media, but never meant any real violence. Zhai apparently had been at Stevens for the last 10 years, receiving a bachelor's degree and two master's before working on a doctorate. Then, this year, he was involved in some sort of romantic dispute, the Times cites a source as saying. A female grad school instructor filed a harassment complaint against him with the police, which led to his receiving a notice of suspension in March. (Global Times) Failed relationship provoked Chinese student in US By Peng Pu. July 6, 2010. A Chinese student jailed in the US after he allegedly threatened to "burn down" a campus building several months ago was apparently angry that he was suspended due to his behavior after a failed relationship. The New York Times reported Monday that Zhai Tiantian, 26, a former PhD candidate at the Stevens Institute of Technology, made the threat during a phone call and was subsequently arrested and now faces deportation. The university's counsel, Chris Adams, explained to the paper that reporters in China mistranslated the charge. He explained that in New Jersey, it has nothing to do with terrorism. The lawyer explained the term is also used to describe "statements made with the purpose to cause serious public inconvenience." "Unfortunately, it shares the same word as 'acts of terrorism,'" Adams told the paper. "No one is suggesting that this is terrorism." The university reported the threat to police and immigration officials and Zhai, who is from Xi'an, was taken into custody on April 15. The paper also reported that the saga was triggered by a soured relationship between Zhai and a female instructor from another school who filed a harassment complaint against Zhai with the police in March. The university subsequently suspended Zhai. Zhai was furious and called the school's administration office and spoke to a campus police officer. He reportedly told the officer, "I am going to burn down Stevens." After 11 weeks in the Hudson County Correctional Center in New Jersey, he was moved to the Elizabeth Detention Center on July 2. He faces up to five years in prison if convicted. However, no formal hearing or trial has been scheduled. What's certain is that since he was suspended, he would likely be deported since his visa was also cancelled, the report said. Zhai entered Stevens in 2000 and completed a four-year undergraduate program. He decided to pursue a PhD program in enterprise systems. Michael Schinelli, vice chairman and a spokesman of the graduate school of Stevens, told the Associated Press earlier that Zhai was considered a smart student by others. Yang Qianqian, a Chinese undergraduate in the US, said Zhai should not be punished too harshly. "This is unfair to an international student, even though he was rude at that moment and threatened the school verbally, he should not be treated in such a severe way," Yang said. "The Chinese students who study in the US are often troubled with loneliness or emotional issues. If such negative elements turn to extremes, it could be significant," Violet Lu, an instructor in the US told the Global Times. (Associated Press) Ex-Stevens student accused of arson threat has charge reduced, to return to China July 29, 2010. The lawyer for a former graduate student arrested for allegedly threatening to burn down a building on the Stevens Institute of Technology campus says the charge has been reduced and his client has agreed to return to his native China. Zhai Tiantian, a former graduate student at Stevens, was arrested April 15 and faced a charge of making a terroristic threat. Zhai's attorney, Ming Hai, said today that a judge has reduced it to a disorderly persons offense. The terroristic threat charge can refer to a range of verbal threats. Some Chinese media outlets initially reported that Zhai was arrested for allegedly being a terrorist. Zhai remains in immigration detention. (People's Daily Online) Chinese student accused of arson mulls suing US police August 11, 2010. Zhai Tiantian, was a Chinese graduate student at the Stevens Institute of Technology in Hoboken, New Jersey, before he was arrested by police on April 16. He has been accused of trying to set fire to a campus building and of making threats to one of his professors with whom he had a disagreement. A friend of Zhai Taishan's friend said Zhai Tiantian would do three things in the following days, according a friend of Zhani Taishan. First, he will have a rest in Beijing for a couple of days and a press conference might be held. Second, he will go back to Hunan. Third, he will consider countersuing the U.S. police who arrested and detained him up to four months in the absence of sufficient evidence, China News Services reported on Wednesday. 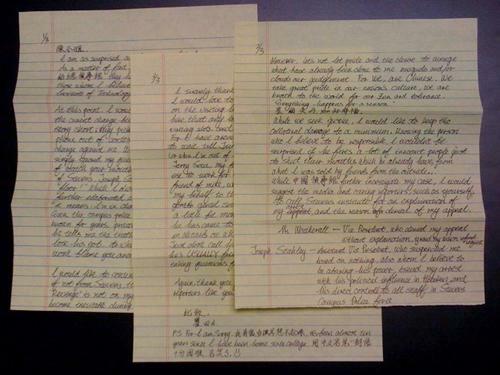 (Global Times) Chinese PhD student to sue US college By Peng Pu and Guo Qiang August 12, 2010. A former Chinese doctoral student at a US college said Wednesday that he will sue the institution for dismissing him and contributing to his months-long imprisonment at a New Jersey jail on a charge of making "terroristic threats," one day after he returned to China under a "voluntary departure." Zhai Tiantian, once a PhD student at the Stevens Institute of Technology in New Jersey, spent almost four months in the Hudson County Correctional Center for allegedly threatening to burn down a school building April 15 after a row with teaching staff, who reported him to police. Zhai insists he didn't make such a threat. The institute suspended the 27-year-old Xi'an native, who was pursing a doctorate in engineering, March 11 for "major violations of the student code of conduct." While insisting his innocence, Zhai, who arrived in Beijing on Tuesday, told the Global Times Wednesday that he was "waiting to be informed by a US prosecutor on a trial date." Zhai said he was determined to take legal action against the institute. "I will not plead guilty to the charge. I will fight for my rights to the end," Zhai said. Zhai had turned down an offer granted by the US prosecutor to plead guilty to a lesser charge of "disorderly person," which, while not a criminal offense, could still have landed him in jail for six months. But given his refusal to plead down, the prosecutor pursued the charge of terroristic threatening. "In a public radio interview in March, I spoke out against the unjustified treatment by the school on Chinese students. My comments must have drawn ire from Joseph Stahley, assistant vice president of student life," Zhai added. Previous reports said Zhai had a verbal dispute April 15 with his professor, Rafael Collazo, over academic work, which allegedly prompted Zhai to call the school's Howe Center Desk and make a verbal threat to burn down one of the campus buildings. Zhai was arrested the same day after university authorities reported him to the police. If convicted, he could receive up to five years in jail, according to US law. The charge of terroristic threatening is a legal term for making verbal threats. He would have to voluntarily return to the states to stand trial or serve any subsequent sentence. "I didn't make that call, nor did I threaten to burn the school building," Zhai said. School authorities could not be reached Wednesday. Zhai's account conflicted with a report by The New York Times in early July, which quoted Jerry Sova, a friend of Zhai who had visited him in jail, as saying that Zhai had admitted using "provocative words" but insisted he never had any intention of committing arson. "He told me that he said, 'I'm going to burn down Stevens by suing them and going to ABC and CBS,'" Sova was quoted as saying. "He is somewhat impulsive." Hai Ming, Zhai's lawyer, told the Beijing Times that he "respects Zhai's decision not to plead guilty, because he should not be wrongly jailed for 4 months under a lesser charge." Hai said in a statement Wednesday that his client was treated as a major criminal offender before his departure to China from New York's JFK airport in the custody of two US Department of Homeland Security employees, as he was handcuffed with chains around his ankles. An undated ruling by the New Jersey Immigration Court, a copy of which was obtained by the Global Times, said Zhai's application for voluntary departure was granted under safeguard until August 30. Interpretations of the case vary, as some claim it is an example of racial discrimination and indicates a flawed US justice system, while others say Zhai deserves to be punished for his inflammatory words. Mo Shaoping, a human rights lawyer, told the Global Times that "many Chinese students in the US do not realize that some of their actions are against local laws." "Students studying overseas should have a better knowledge of local laws and regulations," he added. Recent data released by China's Ministry of Education showed that the number of Chinese students studying in the US has steadily increased in the past few years. This year alone, the number is about 100,000.